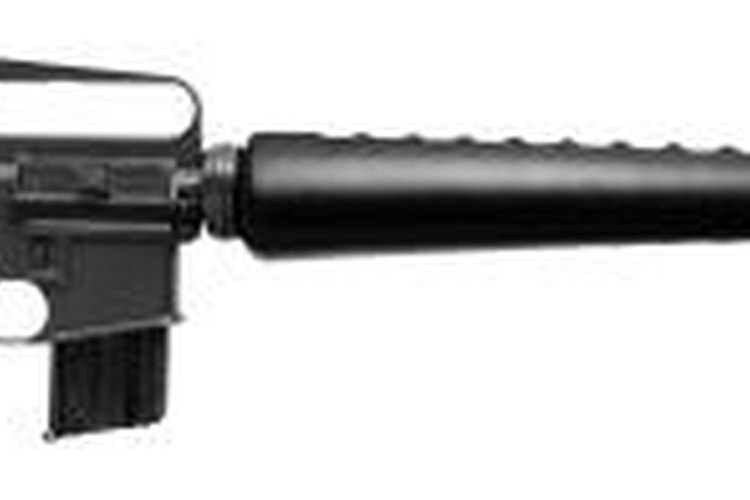 The DPMS A15 rifle is a Colt M16/AR15 lookalike manufactured by Panther Arms and comes in a variety of models chambered for different caliber bullets including the Winchester .22 Long Rifle and the 7.62mm NATO round. Like most knock-offs of the venerable old M16, the A15 is a relatively simple weapon to break down and disassemble--whether it be for cleaning, transportation or the replacing of a part. A few tools might be needed for the operation, but they are inexpensive and easy to come by. Remove the magazine from the A15 and pull the charging handle back several times to eject any cartridges that might be loaded in the firing chamber. Unloading and clearing your gun should be the first step whenever you are working on a firearm. Locate the take-down pin on the left-hand side of the rifle near the back of the receiver--the main body of the gun--just in front of the shoulder stock. Push the take-down pin all the way through the receiver. You might need to use a metal punch at this point because the receiver pin has a tendency to stick. If you do need to use a punch, tap the pin out with the aid of a small hammer rather than trying to force it out with just the punch. Rotate the top portion of the gun--this includes the handle and barrel assembly--counter-clockwise until it is no longer able to rotate. Tap out the pivot pin--the pin located just behind the barrel near the front of the receiver on the left-hand side of the A15--and separate the top portion of the A15 from the receiver. Pull the charging handle backward and out of the top portion of the A15, then remove the bolt assembly by pulling down and backward.